Cassette tapes championed by local tape labels have helped the industry-obsolete format make a resurgence around Portland over the last several years. Although the anti-digital, pro-physical format may lack the quality, fidelity and longevity of vinyl or digital incarnations, it retains a portability and an idiosyncratic classicism as the diminutive, teethed spools move tape from reel-to-reel in a ritual manner. Not quite vintage at this date, but retro in some circles, tapes still brim with nostalgia for all those children of the '80s and early '90s when the mixtape was the same format that ignited gangsta rap careers, catapulted DJs from the streets to clubs to MTV, and may have won over Molly Ringwald in your dreams, or even your real life sweetie, with the perfect mix. Plus, these days all that minuscule magnetic tape can come housed in quiet the variety of neon colors. 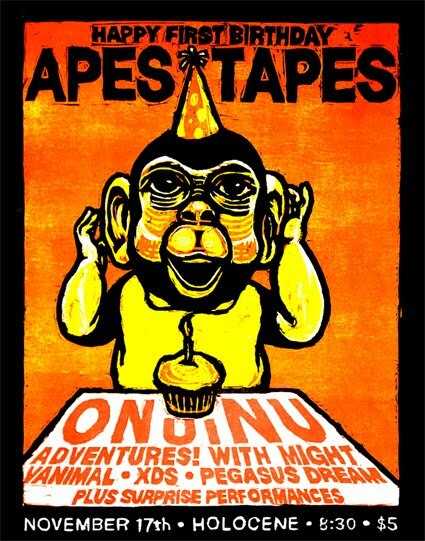 As of late, it's been a conscious choice for Portlanders to establish record labels that serve as manufacturers and distributors of tape-recorded music, and one of the rising players in the current scene, mostly due to their curation and connections, has been Apes Tapes. One year old this fall, Apes Tapes will celebrate their first birthday and the release of Mixed Ape 3 (a 16-song compilation tape, also available digitally, that features cuts from the below performers as well as Aan, And And And, Support Force, Youth, Rico All The Time and more) at Holocene on Thursday, November 17th with Onuinu, Adventures! With Might, Vanimal (reunion performance), XDS, and Pegasus Dream. Plus there will be a surprise DJ and three surprise, guerrilla mini-sets from specials guests--one of which we can reveal: DoublePlusGood! "Continually exploring what it is to be an artist and an artist-run label, walking the fine line between musician and businessperson, maximizing quality and quantity, often with little-to-no money, the label is as much a project as the music itself. It is the epitome of the DIY Portland music scene, and that’s what makes Apes Tapes important." Read interviews with Apes Tapes' Cameron Spies and the performers on OMN.